Unfortunately, news involving animals living in lakes, rivers, seas and oceans are suffering because of plastic pollution. It has become all too common for plastic waste to be thrown into the sea and lake. Countless turtles, fish, sharks, sea birds and dolphins, to name just a few, have been found with plastic items in their stomach or wrapped around their body. These plastic items are familiar to us: plastic beads found in face scrubs and other cosmetics, straws, grocery bags, garbage bags, styrofoam (cups and plates), forks, spoons and parts of plastic bottles. Scientists have found that around 90% of the trash floating in the oceans is plastic. 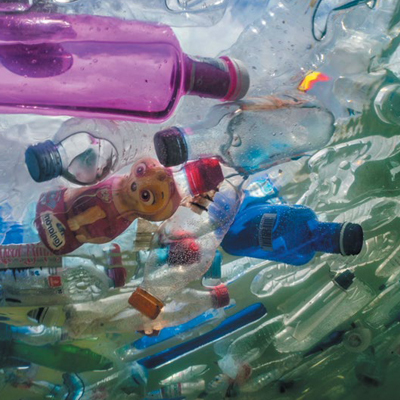 There are 46,000 pieces of plastic per square mile! Plastic is a modern discovery. To put it in a very simple way, it is one of the chemicals in fossil fuels. Plastic was found to be strong and durable. It is also cheap to produce and before the world knew it, it was being used in everywhere – from large factories to our humble homes – and in countless ways too. Plastics are used for covers for computers, in cars, aircraft, medical equipment, disposable containers, bags, furniture and much more. We have become so dependent on plastic products that we find it difficult to think of alternatives because of the durability, convenience, low cost and ease in using them. Don’t get me wrong, it does have its uses. The issue now, however, is its overuse and the extent to which it is used. More important issues are how it is disposed off and the fact that little is being done to recycle or decompose it in a controlled environment. Plastic does decompose but it can take 20 to 400 years to completely disappear!! Until it decomposes, plastic items literally float around and cause pollution on land, in lakes and rivers. They block sewers, choke and kill ecosystems by blocking out light and air, and are often eaten by animals making them very sick and causing discomfort, pain, starvation and eventually, death. beached – hauled up or stranded on a beach. euthanise – put (an animal) to death humanly. durable – Long-lasting; able to withstand pressure and damage. ecosystem – a biological community of organisms interacting in their physical environment.